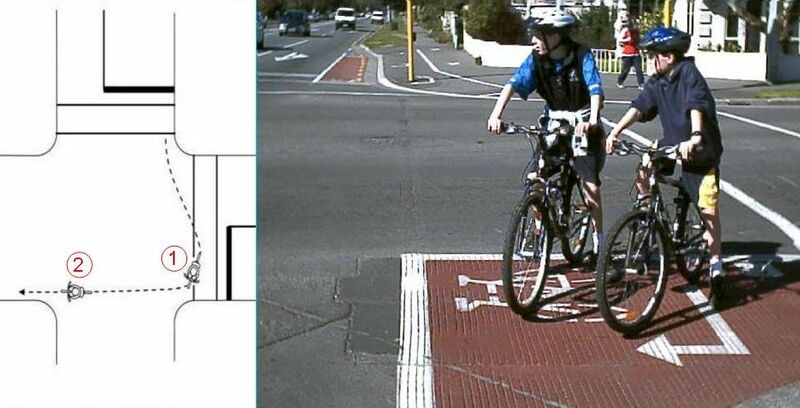 A hook turn is an indirect way for cyclists to turn right at a signalised intersection (see the diagram below). It involves moving to the far side of the intersection (position 1), keeping as far left as possible. 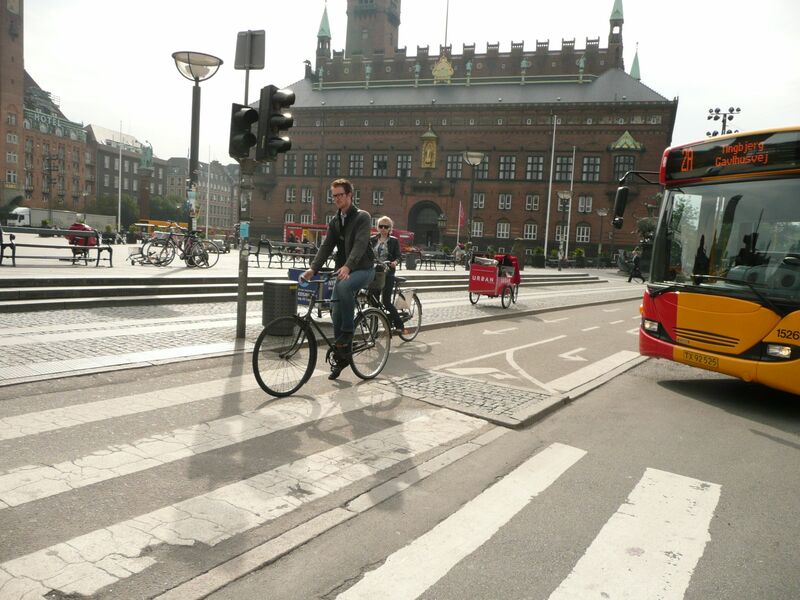 The cyclist then waits there until the side street gets a green light and then moves with side street traffic across the intersection (to position 2). So it is turning right in two stages. Pavement markings can assist cyclists with undertaking this manoeuvre and explaining it to other road users, but some cyclists execute hook turns routinely even without hook turn pavement markings. Under Land Transport NZ's Competitive Pricing Procedures, the dollar limit for negotiated contracts for professional services for road controlling authorities and others (such as regional councils) is now $100,000. This means that councils and Transit can negotiate contracts with individual consultants for up to $100,000, without going through a competitive tendering process. This saves staff valuable time preparing tender documents and evaluating proposals, while consultants save time (and money) preparing proposals. Ultimately this should help keep the cost of engaging consultants down, as less time is spent preparing bids, leaving more time to do real work. The safeguard for councils is that if consultants do not do good work for a good price, they can ask someone else next time. Three new arrivals - welcome! September is going to be one big welcome party for new staff at ViaStrada: Megan Fowler, Jeremy Phillips and Rhys Chesterman. Jeremy Phillips starts as Senior Planner. He is well known in Christchurch and beyond for his planning expertise. Rhys Chesterman, also well known in the transport planning field, is based in Dunedin and starts as a Senior Transport Planner. Megan Fowler joins us as a Traffic Engineer coming from the University of Canterbury, where she has recently completed her studies for a Master of Engineering in Transportation (MET) degree. All three bring strong credentials to the ViaStrada team and increase our diversity and range of expertise. Great to have you on board! 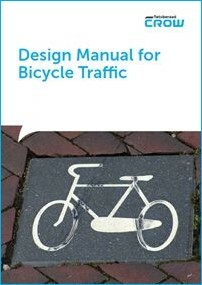 Ordering the new 2016 CROW manual ‘Design manual for bicycle traffic' is easy. The design guide is a revision of the 1993 ‘Sign up for the bike' and the subsequent 2007 edition. Send an email to Klantenservice@crow.nl and request an order form. State that you want to pay by credit card. Once they have received your order form, they will send you an invoice, and a link that allows you to pay for it by credit card. As soon as payment is received by them, they will send the order. Axel Wilke has come back from the 2007 Velocity conference with 'Lessons for NZ'. He presented the most important topics to the Canterbury Active Transport (CAT) Forum on 23 August 07. Please refer to our publications page for more details on the presentation, and read the full report about the conference. 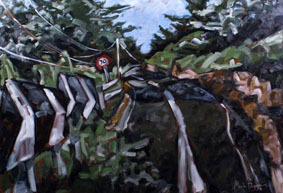 Our office painting ‘Chevrons to 70' by local Artist Mark Duggan has won the first prize in the inaugural Hallifax Emerging Art Award. You bet that we are all pretty stoked. Congratulations to Mark from the ViaStrada team. The 2007 Velocity conference in Munich, attended by ViaStrada director Axel Wilke, was most worthwhile. Below are a few reflections on this conference lessons learned of relevance to New Zealand, and a list of Kiwi attendees. We are pleased to announce that ViaStrada Ltd has been formed by the merger of Streets in Sync and Traffix. We started trading as ViaStrada on Monday 21 May 2007. With our four directors and six staff, we will be able to offer a broader service to our clients than previously. We will operate from our new central Christchurch premises from Tuesday 5 June 2007. Traffix and Streets in Sync are merging in May 2007 to form a new company. With our four directors and six staff, we will be able to offer a more complete service to our clients than previously. We are still developing a new company name and website, and will post these on our websites as soon as they are available. Petr Pokorný, a traffic engineer from the Czech Republic, finished working with Traffix in April 2007. Petr had been with the company since November 2006. Before leaving New Zealand, he spent two weeks in the South Island's rugged high country that he enjoyed so much. The team greatly enjoyed Petr's input and his humour. It would be great to see him back working for ViaStrada sometime.